In the decades that I have been researching the history of Custom Cars, and been searching for Custom Car related photos I have come across numerous spectacular photos. Both in printed material as well as originals. And then so every now and then, out of all those amazing photos, you come across one single photo that for some reason really hits you. 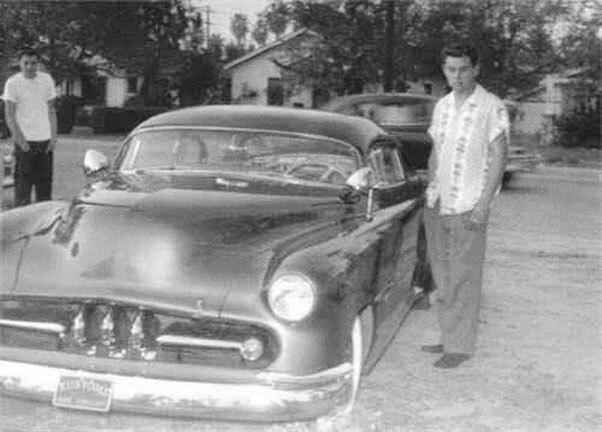 Just that happened when I recently received an email from Thomas Taylor including a small, low res scan of a snapshot showing Dan Landon next to his famous Ayala/Barris 1949 Chevy Custom. Thomas mentioned that he had found the photo posted on the Landon family’s ancestry page and that is was titled ‘Dan and his first car‘. I have always enjoyed snapshots of customs cars… perhaps even better than staged photos, just because they show the cars in their natural environment. It makes it easier for those who have not been around those cars in the 1940’s and 1950’s to see and feel how it really was. This snapshot with Dan Landon next to his Chevy is just that, a wonderful snapshot showing any ordinary day with Dan and a friend. Perhaps they were getting ready to go to a car show, or had jut returned from one. Or perhaps they were about to go out for a cruise to a local drive in, or a weekend out into the mountains with the rest of the Kustoms Los Angeles club members like they did freaquently. Who know… Its just nice to day dream about the setting of the photo. 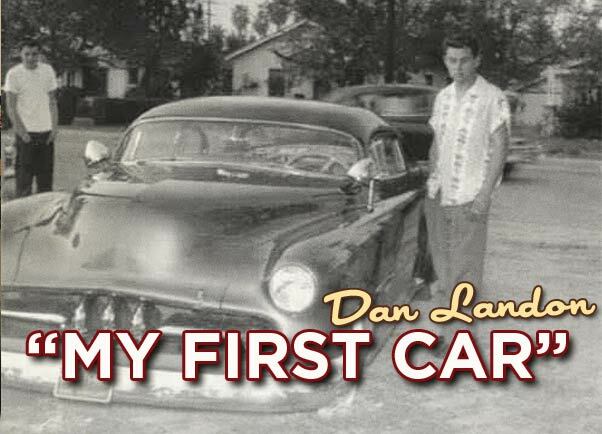 But one thing that really grabbed me about this photo is the title the person who posted gave the photo… “Dan and his first car”. Dan is no longer with us, he passed away in 2010, so we cannot ask him about this photo, or the fact if the Chevy was indeed his very first car. I’m not even sure if it really was his first car, perhaps it was, but since he was born in 1931, he was at least 18 years old when his Chevy rolled from the factory. Its unknown if he bought the car brand new, or used. But all that does not really matter to much for this. The idea of this young guy in his early 20’s owning a stunning 1949 Chevy custom created by some of the top custom shops of the time. The idea that this was his first car, and that 60 plus years later people are going wild over a snapshot they find online. 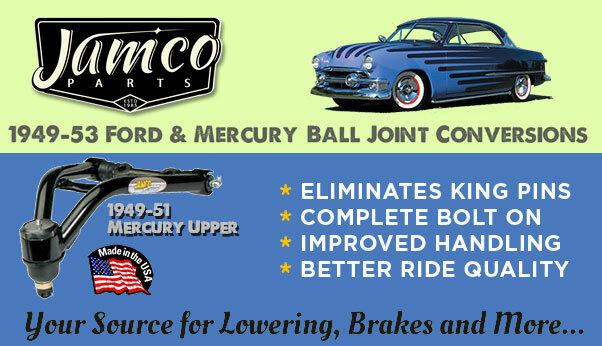 People who are still discussing a car that Dan owned in the early 1950’s in all its details. Analyzing what all had been done to the car, getting inspired by it to create their own personal restyled car. The photo that was shared on the Landon family ancestry web page. ‘Dan and his first car’. Of course not realizing that this very snapshot would be shared all over the world over 60 years later! At the time when Dan had the Chevy built, he most likely just wanted to have a great looking custom car, just as his friends. A car he could use to pick up girls, cruise the drive-ins, and show at the major California Car shows. Getting your car featured in the magazines was a HUGE bonus, but dreaming your car would inspire people decades after the car was first built… I do not think Dan had ever thought about that. I have never met or talked to Dan Landon when he was still alive, so I do not know if he stayed in touch with the scene. But I sure do hope that he was aware how much this car means to the Custom Car world. How much impact it had back then, he most likely knew that, but also how much is still means today, and how many people still get a huge smile on their face if they look at picture of this Chevy. Not bad for His First Car. Thank you Thomas Taylor for sharing this great snapshot. 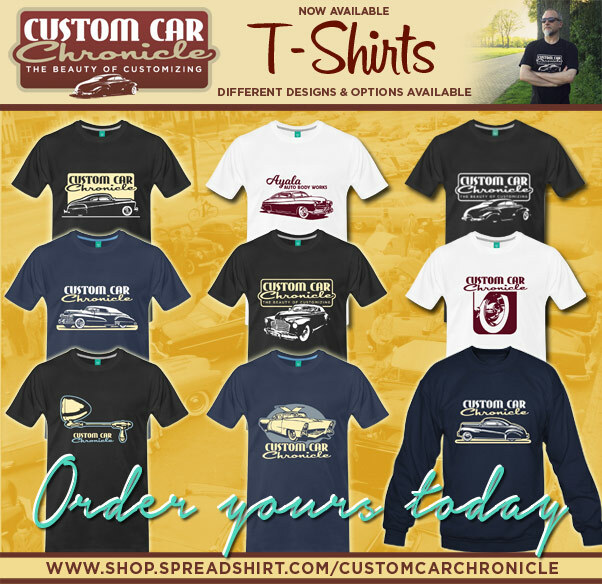 If you want to see more photos of Dan’s breathtaking 1949 Chevy Custom, then check out this CCC-Article we did some time ago. Yes! What an inspirational find. That very car got me going back in the day. 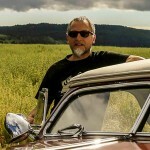 Rik, please do a T-shirt with an image of this car!!! It would be wonderfull to find out what happened to this car. it was a great one. Such a great photo and of coarse a great sled. Cool article Rik, good reading. Ya I would really love to know what happened to this heavy chevy ?